REDMOND, Wash.--(BUSINESS WIRE)--It began as just another typical flight, but minutes after takeoff, the passengers on Southwest® flight #2482 on Wednesday, Dec. 14, found themselves immersed in the world of Mario. As they cruised past 10,000 feet in the air, the voice of Nintendo’s iconic Mario announced a big early-holiday surprise for all the passengers. Quickly all were presented with a free New Nintendo 3DS XL system to take home, along with a voucher to download the recently launched Super Mario Maker for Nintendo 3DS game for free from Nintendo eShop. Nintendo reps helped the passengers play and create side-scrolling 2D Mario courses on the portable system, which make great travel companions during the busy holiday travel season. 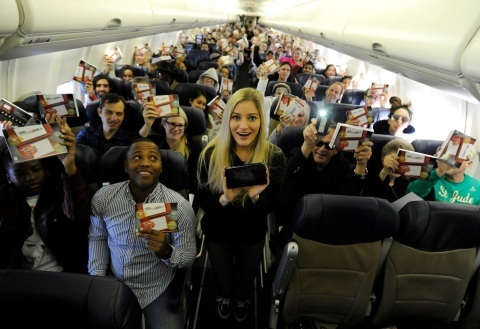 Among those lucky passengers offering in-flight game tips was iJustine, a Nintendo fan and YouTube celebrity whose followers measure in the millions. And once the flight landed in Los Angeles, Mario himself was waiting to welcome them at the gate. Super Mario Maker for Nintendo 3DS features 100 built-in courses, and also allows entry to recommended courses from the Super Mario Maker game on the Wii U console. In addition, courses designed on Nintendo 3DS can be shared with other players via the system’s StreetPass feature and local wireless. Nintendo 3DS systems provide a fun escape for travelers on the go – adults and kids can play games to stay entertained during long flights or layovers. The systems are always ready to go anywhere travelers want to go. 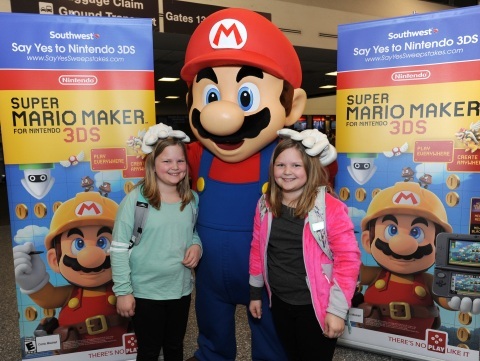 The flight was the first leg of a Say Yes to Nintendo 3DS promotion with Southwest Airlines that runs from Dec. 16 through Jan. 14, and is open to U.S. residents who are at least 14 years old. Just in time for the holidays, prizes will include Nintendo 3DS hardware and games. While dozens of entrants will receive prizes, one lucky Grand Prize winner will be awarded a trip to New York for up to four people, roundtrip air travel on Southwest for four, a four-night hotel stay, plus a personal shopping spree at the Nintendo NY store. To enter the sweepstakes, visit http://www.sayyessweepstakes.com during the promotion period and follow the links and instructions to submit the registration form*. Remember that Nintendo 3DS features parental controls that let adults manage the content their children can access. Nintendo 3DS players who register a Nintendo Network ID (NNID) get access to free-to-start games, including Pokémon games; the ability to download and play variety of free game demos from Nintendo eShop; and exclusive offers and the latest news directly from Nintendo. For more information about other features, visit http://www.nintendo.com/3ds. *NO PURCHASE NECESSARY. A PURCHASE WILL NOT INCREASE YOUR CHANCES OF WINNING. OPEN TO LEGAL RESIDENTS OF THE 48 CONTIGUOUS UNITED STATES AND DISTRICT OF COLUMBIA (EXCLUDING FL, NY AND RI) AGE 19 YEARS OR OLDER. Void in AK, FL, HI, NY, PR, RI and where prohibited. Sweepstakes ends 1/15/17. For Official Rules, prize descriptions and odds disclosure, visit www.sayyessweepstakes.com. Sponsor: Southwest Airlines Co., 2702 Love Field Drive, Dallas, TX 75235. In its 46th year of service, Dallas-based Southwest Airlines (NYSE: LUV) continues to differentiate itself from other air carriers with exemplary Customer Service delivered by more than 53,000 Employees to more than 100 million Customers annually. Southwest operates more than 3,900 departures a day during peak travel season across a network of 99 destinations in the United States and eight additional countries with additional Cuba service to Havana, Cuba, beginning Dec. 12, 2016, and Santa Clara beginning Dec. 15, 2016. Based on the U.S. Department of Transportation’s most recent data, Southwest Airlines is the nation's largest carrier in terms of originating domestic passengers boarded. The Company operates the largest fleet of Boeing aircraft in the world, the majority of which are equipped with satellite-based WiFi providing gate-to-gate connectivity. That connectivity enables Customers to use their personal devices to view video on-demand movies and television shows, as well as nearly 20 channels of free, live TV compliments of our valued Partners. Southwest created Transfarency®, a philosophy which treats Customers honestly and fairly, and in which low fares actually stay low. Southwest is the only major U.S. airline to offer bags fly free® to everyone (first and second checked pieces of luggage, size and weight limits apply, some airlines may allow free checked bags on select routes or for qualified circumstances), and there are no change fees, though fare differences might apply. The airline proudly unveiled a bold new look: Heart. A new logo, aircraft livery, interior design featuring a new seat and Flight Attendant galley, Employee-designed uniforms, and an updated airport experience all showcase the dedication of Southwest Employees who connect Customers with what’s important in their lives.